L: 71.5" x W: 37" x H: 39"
Basin Chenille Loveseat With plush gray chenille upholstery surrounding the stylish rolled arms and comfortable back and seating cushions, the Basin loveseat features black nickel-finished nailhead accents to enhance the rich contemporary style. With plush gray chenille upholstery surrounding the stylish rolled arms and comfortable back and seating cushions, the Basin loveseat features black nickel-finished nailhead accents to enhance the rich contemporary style. We are very happy with the loveseat and convertible couch. They are very comfortable and the set came with 7 pillows!! Very comfortable, no problems or wear after 2 years. I’m so in love with this sofa! It's what. I am looking for! Great quality! Comfortable, sturdy and delivery was a breeze. It matches nicely with our sofa. We are very happy with our purchase so far! Everyone was very helpful and polite. 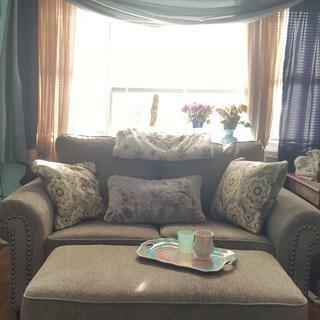 Love this loveseat. Cozy and comfortable. Definitely recommend! BEST ANSWER: The seat height is 19". Will you take my old loveseat? BEST ANSWER: Hi Lindsay! We will only remove your old mattress and box spring with the purchase of a new mattress and box spring set. For other furniture removal, we suggest contacting a local charity or rescue mission. Raymour & Flanigan delivery professionals reserve the right to refuse any old bedding deemed unsanitary. I didn't inquire about a mattress. I'm planning on buying a loveseat. 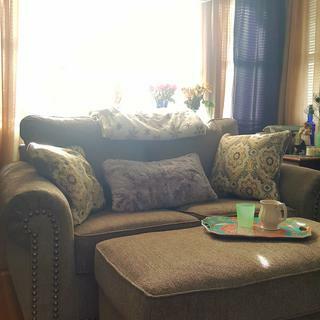 Will you remove the old loveseat? Yes, I understand you would like to buy the Basin Chenille Loveseat however we only remove mattresses. We don't remove other furniture from your home such as a loveseat. minimum width on the door entrance? BEST ANSWER: The minimum width of a door entrance for the Basin Chenille Loveseat is 32". BEST ANSWER: The seat depth is 22". are the cushions removable or attached? Is the the color green in the accent pillow? BEST ANSWER: The seat cushions are removable and the back cushions are attached. The colors included in the pillows are actually a golden tan, gray and a beige background. Can I see this in the store before deciding to purchase? BEST ANSWER: Yes. The Basin Chenille Sofa and Loveseat are Outlet items which will be displayed at a Raymour & Flanigan Outlet Center. Is this truly grey? I love it but looking for more tan. BEST ANSWER: The color of the Basin Loveseat is a gray.